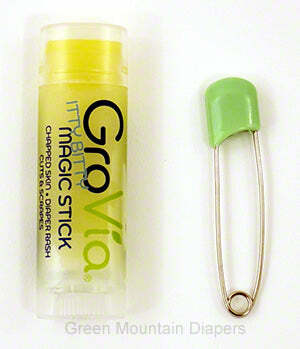 GroVia Magic Stick. Clean. Simple. Organic. All-Natural Diaper Ointment. Keep your hands clean when applying diaper balm on the go. Creams are not typically needed when using cotton diapers but sometimes during teething or other times you might need some protection. GroVia™ Magic Stick’s all natural and organic ingredients and petroleum-free formula is safe to use with cloth diapers. •Safe to use with both cloth diapers and disposables. •Use a light layer to protect baby's skin from wetness. •Hate greasy, messy hands? Great NO MESS packaging makes application a cinch. Just the right amount will be left on baby's skin and NONE on yours! •Safe to use for minor skin irritations....chapped skin, stretch marks, most anywhere you need extra moisture. •Made with natural and organic ingredients. Ingredients: Vitis Vinifera (Grape) Seed Oil, Beeswax, Lavandula Angustifolia (Lavender) Essential Oil, Simmondsia Chinensis (Organic Jojoba) Seed Oil, Rosa Canina (Rose Hip) Fruit Oil, Limnanthes Alba (Meadowfoam) Seed Oil, Butyrospermum Parkii (Shea) Butter, Calendula Officinalis (Organic Calendula) Flowers (and) Olea Europea (Organic Olive) Oil, Melaleuca Alternifolia (Tea Tree) Leaf Essential Oil, Anthemis Nobilis (Roman Chamomile) Flower Essential Oil, Chamomilla Recutita (German Chamomile) Flower Essential Oil, Tocopherol (Vitamin E). To Use: Use as needed with diaper changes and at night before bed. Apply to clean, dry skin. Use only one stick per child. Regular size is 2 ounces. The itty bitty size is just .15 ounce. It's similar in size to lipstick so it's very lightweight and small for the diaper bag. Creams are not typically needed when using cotton diapers but sometimes during teething or other times you might need some protection. Why are creams not needed when using cotton? Because cotton isn't sucking baby's normal skin moisture right out because there are no superabsorbent chemicals in cotton. In the throw away kind, you need to protect the skin from the moisture-sucking chemicals buy using a lot of rash cream. But in cotton, that doesn't happen so you don't need that protection. In cotton skin breathes and moisture is really ok for skin for a while. But during teething or illness some protection can be helpful occasionally, and this is a good one. If used occasionally it will wash out, but if used regularly then use a flushable diaper liner to keep it off of your cotton. The itty bitty size really is itty bitty. It is small like a lipstick. Shown here next to a diaper pin for perspective. It is very small and light. I love this product! Really does work magic. I like that it's tiny for a minimal diaper bag. It's not my favorite bum product (others tend to work better for my boy), but it does in a pinch b/c the size and ease of use makes it great for travel and minimizing 'stuff' when we go out. Too small. Doesn't work well and I would not buy again. Sticking with a different brand next time. I love Grovia though. Perfect size for the diaper bag and eliminates any redness! Love it.